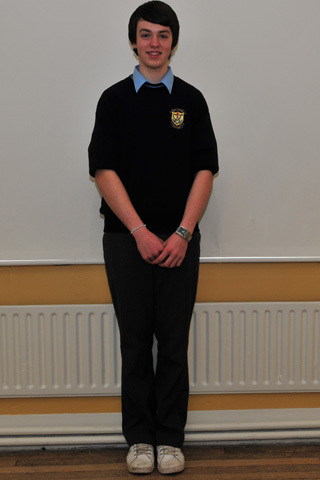 The school uniform is available only from Durkins, Ballymahon St., Longford. The official school skirt should be knee length, have a pleat in the back and has a small tag with “H” on it. No other school skirt will be permitted. The official school trousers have the CMG logo on pocket. No other trousers will be permitted. Navy blue crew-neck jumper with school crest, drop shoulders and light blue strip around neck. O’ Neill’s navy tracksuit bottoms – boys version. Hooded sweat shirt with school crest. In the interests of Health and Safety only flat-soled shoes or runners can be worn in the school. Pupils are required to be dressed in the school uniform for all school and school-related activities. This includes entering and exiting school. Uniform should be kept neat and tidy and only items of uniform should be visible. All pupils are expected to behave in accordance with school rules when dressed in school uniform. This is because their behaviour, when so dressed, reflects not only on themselves, but on the total student body. All uniforms should be marked clearly with the student’s name. Students not wearing the full uniform will not be allowed into class except in exceptional circumstances. If a student is not in correct uniform, parents/guardians may be contacted or the school will provide the uniform for that day. All students should have back-up items of uniform as the excuses that the uniform is in the wash or damaged will not be accepted. Jewellery should be simple, minimal, hygienic and safe. Boys may not wear earrings/studs of any kind. Girls may wear one pair of ear studs.